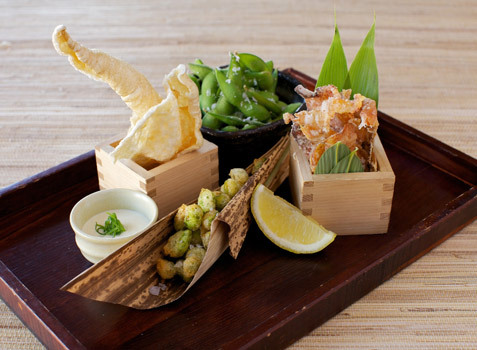 When it comes to Japanese food in London, you’d be hard pressed to find dishes as beautifully executed and creative as those that Wabi has on offer. Hidden away in Holborn, this new restaurant has former Nobu head chef Scott Hallsworth at the helm and is a must visit. I tried the ten course Contemporary Kaiseki Tasting Menu, which, although a little more towards the expensive end of the spectrum at £75 a head, is worth every penny. On top of this, each course had a wine expertly matched by Wabi’s sommelier, Bernie Molloy. Stand out dishes from the taster menu were the seabass sushimi served with homemade yuzu koji, the lobster and chips, warm Loch Duart salmon served with lemon miso, chilli salsa and burnt cedar as well as the aged rib-eye ishi-yaki. Although every course was mouth-wateringly wonderful. Being a complete red wine fiend my favourite tipple of the night was the delicious Saint Clair, Lone Gum Block 12, 2010, Pinot Noir from Marlborough, New Zealand. It was rich and beautifully bold. But, again, each wine was matched to perfection and complemented each dish beautifully. I am in food heaven just thinking about Wabi and I can’t wait to go back.